8 Anti-drone Activists Block Main Beale Drone Base for 1 hour, No arrests! 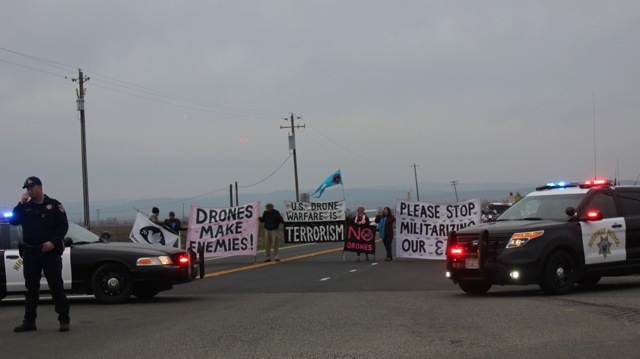 On Tuesday during early morning commute, 8 Anti-Drone activists blockaded Wheatland road into Beale Air Force Base for 1 hour and 20 minutes, during the morning commute. The majority of military personnel and non-military personnel enter through this gate each morning, totaling hundreds of vehicles. In a continuing 4 year long monthly resistance to illegal drone assassinations and perpetual war, these activists refused to get out of the road when a very polite highway patrol officer arrived after the first half hour of blockade. After much initial discussion between the officer and the activists, the officer radioed into his supervisor, who gave him the order not to arrest. Within 10 minutes another officer arrived on the scene, and the two officers proceeded to use their patrol cars to create a barrier between the peace activists and the commute cars, creating a second layer of blockade. All drivers trying to get into the base that morning were forced to take a long detour to other gates, significantly delaying their arrival to the base. Occupy Beale Air Force Base activists were motivated by the recent continued escalation of illegal drone attacks by the Obama Administration in Pakistan and Yemen, as well as in Iraq, Afghanistan, Syria, and elsewhere. Just on Monday a 12 year old boy, Mohammed Saleh Qayed Taeiman, was killed by a U.S. drone attack in Yemen, along with 2 adults, while driving on a roadway. Mohammed had lost his father and 17 year old brother by a U.S. drone attack in 2011. Connecting the dots to the rampant police violence against black and brown people of color, activists brought the "Black Lives Matter" theme to Beale this month. "From Ferguson to Pakistan, Oakland to Afghanistan, STOP THE RACIST KILLING." A flyer (see attachment) distributed to Beale personnel, explained the extreme racism that exists both in U.S. global warfare, drone killing and in law enforcement practices, where lives of people of color and people of other cultures are so easily expendable. Occupy Beale activists refuse to be complicit in the dehumanization of other peoples' lives. The one hour-plus blockade was very successful in stopping "business as usual" at Beale Air Force Base and demanding that these policies change. Interestingly, on Mon. afternoon, when activists had gathered for a vigil at the Doolittle gate, where much less traffic enters and exits the gate, a CHP officer arrived mid-way, and was very aggressive in trying to intimidate Toby, who was standing at her "usual spot", passing out flyers. Toby left the "gore" divider in the roadway when the intimidation continued to escalate, but returned back to the gore to distribute flyers after the officer left. Michael Kerr was a tremendous support, by continuing to cross back and forth at the intersection with his Veterans For Peace flag, which greatly de-escalated the situation. Fox 40, a Sacramento based tv news cameraman was on the scene on Monday, and a story of our protest was aired, which included a interview with Barry Binks, who helped get the truth out about drones to the public. Hope some of you reading this report will consider joining us at Beale or Creech drone bases soon.